If I asked you, “What is the most important piece of backpacking equipment?” What would you pick? Would you say the backpack or a tent? Maybe a sleeping pad or portable stove? Those are all very important things. And it’s tough to choose the most important one. Personally though, if I had to pick one thing, I would very likely say my hiking boots. As someone who works in the outdoors, I rely on the boots that I wear every single day to keep me safe as I hike both on and off the trail. 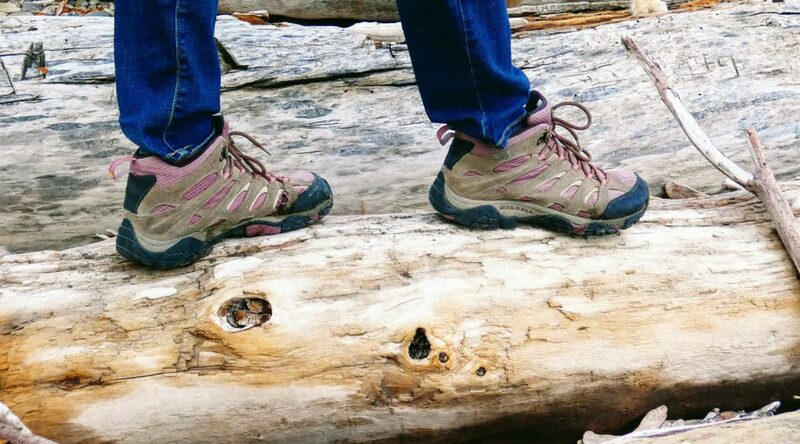 For the past 3 field seasons, I have been using Merrell women’s hiking boots. I have put a lot of miles into and thoroughly tested these boots in all terrains and weather. 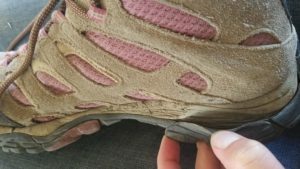 I would like to share this Merrell hiking boots review with you to help you decide if they might be right for you as well. The specific boots that I currently use are the Merrell Women’s Moab 2 Waterproof hiking boots, which are just over $100. But much of my review can probably be extrapolated across the whole line of Merrell boots, of which they offer many, to some extent. I’m not going to spend a lot of time talking about the specific features of the boot as quoted on the Merrell website such as, “shock absorbent air cushion in the heel,” and “blended EVA contoured footbed with added zonal arch and heel support.” You can read even more fancy words on the product description. Instead, I want to focus on the nitty gritty of what’s really important. When you’re on your third day of backpacking you don’t care if your boot has performance suede leather. You care if it’s giving you blisters or not. 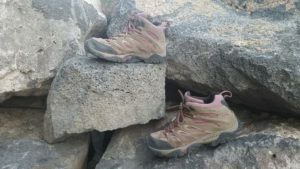 Over the course of the past several years, I have identified the qualities that I believe to be the most important when selecting a hiking boot. These qualities in order of importance are: comfort, support, durability, weather resistance and, to a lesser extent, appearance. If you are looking for hiking boots in a store, you can somewhat identify the strength of the boot in a few of these qualities. However, it is impossible to tell how durable the boots will be over time, or how weather resistant. You also will not be able to tell how supportive or comfortable the boots will be once you actually begin to put them through their paces, out on the trail. If you are shopping online instead of in store, which is highly likely, you won’t be able to test any of the qualities and will have to rely on the manufacturer’s or seller’s descriptions. This could lead to the hassle of returns or possibly spending money on a boot that quickly becomes useless to you. That is why I want to provide you with a comprehensive review that you can trust, from someone who has used these boots almost daily for the past three summers. Do you love comfortable shoes? Excessive sliding also increases the chance of blisters. And I am happy to report that I can’t recall a single instance of having a blister on my foot since I bought my Merrell’s. The true fit has also allowed me to wear different types of socks based on my needs without sacrificing comfort. I can wear thicker socks in colder weather or when I am hiking off trail and will encounter many more sharp grass seeds and brush. I can also wear ankle socks when I am trail hiking. The boots fit well for me in either condition. 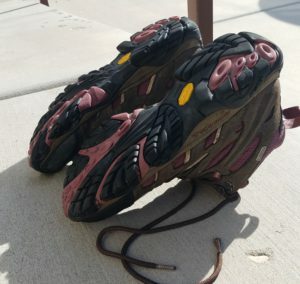 I began to wear them straight out of the box while working at a national park where I frequently hiked around 10 miles a day. They did not seem to require much of a break in period. I was able to wear them regularly right from the start. The insoles are removable, so I was able to replace them with some custom insoles that I wear for added foot protection. I still have the insoles that came with the boots and I am able to switch them out when I need to. The mesh lining is breathable and allows moisture to escape as you are hiking. And the air-cushioned sole absorbs shock and softens the blow to your joints and bones as you tread repeatedly along the trail. I rate the overall comfort a 5 out of 5, because they fit well, help me avoid blisters, and allow me to mix and match socks and insoles for my specific needs without sacrificing comfort. I measured support based on how well the boots protect me from injuries and missteps in the field. Merrell offers both a mid and low height of many of its boots. The top of the mid boot comes up above the ankle joint, where the low hiking boot is more like a traditional shoe. I often need to hike on very uneven terrain so I prefer the mid-height because of the added ankle support. I have sprained my ankle on more than one occasion throughout my life, which can weaken the ankle, so I am often worried that it could happen again in the backcountry. The closest I have come to this disaster was when I was coming off a steep hill and had to run to keep my balance. My ankle twisted painfully during a misstep but luckily my boots provided enough support that it only pained me for a short time instead of the days it potentially could have. The boots can be laced around an extra bracket at the top of the boot, which helps firmly secure the boot to the foot and lower leg. It helps me feel sturdy and balanced as I hike on all types of surfaces. I rate the Merrell boots support to be a 4 out of 5, because though they are excellent there are boots out there that lace up even higher which provides even more stability. However, the mid-size is an excellent trade-off because it still provides a lot of stability and is more comfortable to wear than many hightop boots. This is a category that you can’t find in many online reviews because most people review the item quickly after receiving it and testing it out. Well, I am here to tell you that I have literally hiked thousands of miles in these boots through rain, mud, and sometimes even snow. So I believe that I now have an excellent idea of durability. Both the fabric of the boots and the rubber has held up extremely well considering the amount of abuse I have put them through. This summer was the first time I have ripped the fabric. This is after three years of owning the boots. There is now about centimeter long rip in the fabric. The rubber portions have also held up reasonably well. The rubber sole has begun to come away from the side of the shoe in one place. This is a minor annoyance because it collects grass seeds that can hide away in the crevice created. But it doesn’t compromise the support or comfort. I’m sure that it could easily be fixed with some super glue, I just haven’t gotten around to it yet because it hasn’t caused enough of a problem for me to remember to do it. The bottoms of the sole are still in great condition. They provide excellent grip on steep trails. I still use them to hike up and down steep sandstone slickrock without fear of slipping and falling. I give the Merrell boots a 5 out of 5 for durability, because of the sheer amount of time and miles they have lasted me. Judging by the way things have gone up to this point I look forward to continued use for many more miles. These boots are marketed as waterproof, and they are to a certain extent. This is the one area where I have found these boots to be slightly more lacking than some others I have tried. I have gotten my Merrell’s soaked through after walking several hundred feet through a dewy sagebrush range. They have also soaked through when I have worn them during extended periods in the rain. However, they have successfully kept water out while trail-hiking through short water crossings, as long as the water does not go over the top of the boot. So if you are looking for boots to keep your feet dry in a similar scenario I would say they are adequately waterproof to your needs. On another note, if the boots do get thoroughly soaked, they dry fairly quickly. I have even had them dry on my feet after a morning soak and have found my socks to be completely dry at the end of the day. If you’re worried about waterproofing there are waterproofing sprays that you can buy to increase the weather resistance of the boot. These work great because you can reapply them whenever you feel the need to boost the boots waterproofing over time. I rate the weather resistance of these boots a 3 out of 5 because they have sometimes soaked through while walking through a damp field or in the rain. But they do hold up well during river and stream crossings. The Merrell Moab 2 hiking boots come in several stylish colors. And you can find an even greater variety if you browse the other boot styles. They are primarily made of suede leather and mesh which is both attractive and suitable to the fashion savvy backpacker. I myself am not extremely worried about looks. But I do appreciate the ability of the Merrell Moab 2 to continue looking nice and clean up well, after miles and miles of use. I once got trapped in a canyon and had to trek through several knee deep pits of smelly canyon mud and ice to get out. After this, I was worried that my boots would be dirty and smelly forever. Thankfully they cleaned up after several rounds of strong power-washing in the shower. Likely you will never have to get your boots this disgusting, but rest assured that if you do, the boots will not be forever ruined. I rate the Merrell boots 5 out of 5 on appearance because they are both stylish and clean up quite easily to look like new even after many vigorous hiking sessions. Do I recommend these boots? The short answer is a resounding yes. If you are looking for a stylish, comfortable, supportive boot made by a trusted brand that will last you quite a long time. 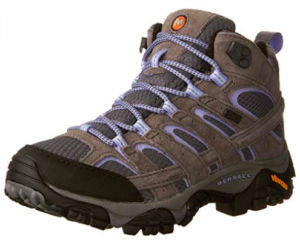 The Merrell Moab 2 Mid style boots are an excellent choice. They are versatile and can be used across all terrains from desert canyons to alpine tundra. I have personally worn them in these habitats and everything in between. I have used these boots for three years and they continue to score quite high in all of the most important ways. 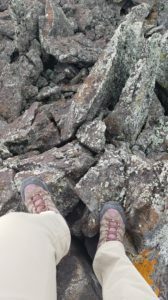 I look forward to more years of use with my current pair of Merrell’s and would not hesitate to purchase them again or branch out and try a different model from Merrell. I hope that you will give them a try and let me know how they work for you and your two feet! I would love it if you would tell me about your favorite hiking boots and where they have taken you, or If you have tried Merrell boots already, in the comments below. And as always if you have any questions or need a hand please feel free to comment as well. 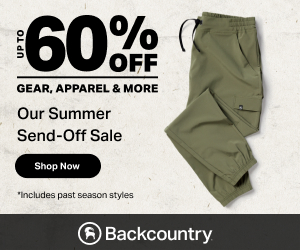 Ready to check out some more backpacking gear? Thank you for this post. Whenever I had purchased hiking boots I always felt that was kind of a crapshoot. You can read what other people say but then as you mentioned, most people review things shortly after they get them so you don’t know what their thoughts are long-term. It’s great that you’ve been wearing these boots for a long time and can give that perspective. Thanks for reading. I totally agree, there is always a gamble when buying hiking boots. And usually they’re pretty expensive so you don’t want to waste money on a bad pair. I lucked out with these boots so I wanted to share my experience with them. the rubber at the sole is glued to the fabric main body of the shoe? does it hold well? I have only encountered the one area shown in the picture where the rubber sole is starting to come away from the main body of the shoe. I have not tried super gluing it back on yet. It’s possible that it was caused by the same issue you describe. Aww, I am really surprised by how clean the boots are after you’ve cleaned them. So clean that you can’t even tell they are entirely covered by muds before! Just one little question here. Are those boots unisex? Or they are for women only? My hiking boots are still in good condition so I don’t really need one currently but my husband does! And, this pair looks like a great option! The ones I have pictured are specifically for women, but there is a Men’s version of the same style. The men’s boots are actually a little cheaper in price as well! I’ve always wanted a pair of Merrells! These sound fabulous. Currently I just use my tennis shoes, but I need something more durable, especially as my kids get older and can start to handle more hiking. Thanks for this awesome review! You’ve covered all the important bits here. I was left with one question in particular though, after reading your Waterproof section. 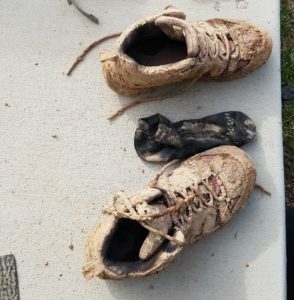 You say that despite the fact these shoes were marketed as waterproof, they didn’t hold up very well in extreme conditions or extended water traversing. Will this be the same for all other hiking shoes marketed as waterproof, or is there a way to measure the relative ‘waterproofness’ of the shoes based on some kind of scale? Thanks. To my knowledge there’s no waterproofness scale for hiking boots. It is true that many boots marketed as waterproof will not hold water out under extreme conditions. It’s kind of just something you have to try out and see if it works. For that reason, many people apply water proofing spray to their boots even if they are already supposed to be water proof. Thanks for your review. I really enjoyed reading it. I have been looking for some good durable and comfortable hiking boots for some time now. So I am very glad that I found your review on these Merrel Hiking Boots. They seem to be the perfect match for me. Once again, thanks for your very in depth review. Thanks for reading! I hope you will pick up a pair for yourself. I have a pair of Merrell boots for hiking hanging around. I think they are fabulous for everything you say. After a day of hiking my feet don’t feel tired and I don’t feel the need to rip the boots off my feet. My feet don’t get too hot unless it is extraordinarily hot outside so in those areas I am happy with them. Just as you say and I’m glad I’m not alone is that the waterproof ability is lacking. I have had more than my share of wet feet from rainy days and I don’t like walking in wet feet. I haven’t worn then for a while because of this and we are in a wet fall season so I will wait until next summer for them. Have you ever tried waterproofing on them? I personally have not tried it with my Merrell’s but I know you can get a can of spray for around $5. Definitely when you think about hiking, the first thing that comes to my mind are the boots, well at least I’ve always thought so and when I’ve never done this activity in my life before. The boots are the most important, because they are the ones that will help you take a good step and feel less tired than usual and take you to your goal. It will always be difficult to find boots that have waterproof, at least in situations of extreme weather or when you have to go through a small lake. Still I liked the recommendation of these boots, I enjoyed reading it. Me and the rest of the family like to go hiking in the lake districts so finding a pair of durable hiking boots each year is something I’m on the look out for. Thanks for sharing this review of merrell hiking boots, not only does the design look good but they also seem to tick all the boxes. I might check them out and see how they feel on my feet as I’m new to Merrell footwear. You know your boots inside and out! This is one of the best reviews of any pair of footwear I’ve seen in my entire life and based on your experience and rating, I’m tempted to go buy a pair (and I’ll never be able to hike again) just to have! I actually think they’re also quite stylish! You make excellent points on the ins and outs of what to look for (and find) in a pair of hiking boots. Great review! You know before running across this article I have always thought about how poorly my shoes handled the terrain. I have always thought I always slid on slopes because I was overweight and my weight was the cause and never thought hey maybe I need some hiking shoes to handle these trails. I will definitely have to look into getting myself a pair of these. Thanks! Hi, thanks for reading! Good shoes make all the difference. I’m with you Mariah, I agree that hiking boots are the most important gear for backpack adventures. I think we all too often forget how important the health of our feet are to our overall well being. Technology in backpacking gear has really changed over the past decade well since when I first bought hiking boots about 15 years ago. Thank fully too, remember the options used to be huge cumbersome boots with little variety to choose from and needing break in periods. Delighted to hear these Merrell boots you wore almost out of the box. So I’m definitely going to take a closer look. Thanks for sharing. Thanks for reading! If you purchase a pair, let me know how you like them. What a blessing finding your article and the review on Merrell Hiking Boots. I am looking in replacing my old Hiking Boots, which I had for the last 10 years, and yes, until then they too worked well and I was satisfied in wearing them. However, now is the time to renew them. I am also pleased that this Hiking Boot also comes in different width since my feet got a bit wider and to have a comfortable fit is also, to me, very important. Thanks for this review it answers all the questions I had. So glad I could answer your questions Sylvia! Thank you very much for your great review. I really like the fact that you post the real photo of you using the shoe. I run a lot and my current running shoe (Nike) is starting to worn out a fair bit so I will put this into my Christmas wishlist. Based on your experience, do you think if this shoe is comfortable for running? I wouldn’t necessarily recommend a mid-height boot for running. I have done some occasional running in these Merrells but only for short bursts down steep trails and things like that. If you’re wanting to do a lot of running, Merrell has a few different models of dedicated trail runners. I haven’t personally tried them out but you can click here, and here to check out a couple of the models they offer. What a great idea to include this review on your website! I totally agree with you about online shopping, and about most of the reviews being written right after the purchase. With a boot, or anything that one hopes to have for a length of time, it is really helpful to have a ‘later-in-time’ review to have some idea of durability. Like you said, when you spend that much money, you hope it lasts! Thanks for sharing your experience and recommendation. Thanks for reaching out Cris! I really enjoyed your review, especially the durability section. It’s good to know that the boots have been used for more than a one day hike and have held up well over a few years. I’m also amazed at how well they cleaned up after your canyon walk! I’m not much of a hiker and only go for the occasional bushwalk (is that term too Australian lol?) 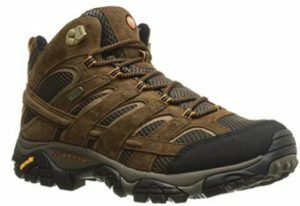 Would you say these are worth the investment or are there boots more suitable for the every now and again hiker? I would say these are great for an “occasional bushwalker.” They are comfortable and sturdy and they will last you many, many bushwalks 🙂 They are a good priced boot as well. It’s an excellent value. I have never tried out the Merrell Hiking boots, but because I enjoy hiking in all kinds of terrain, I am researching a good boot. Because I have Type 2 Diabetes also, I need a boot that is lightweight, but heavy-duty. Do you think the Merrell brand would have a boot to fit those specs? I have neuropathy and have to be extremely careful with my feet. I don’t want to have to give up hiking (and, in fact, hiking has probably kept me from further damage from the diabetes). I love the look of the boots and look forward to where they might take me! I think the Merrell Moab could be a great choice for you. The boots are lightweight yet they still offer a lot of protection. I have worn them in more types of terrain than most people will ever care to go, because of the jobs I have had, and they have kept my feet and ankles safe and comfortable. I encourage you to keep on hiking as long as you can!